Adams Business Forms provide the tools to help keep track of messages, finances, transactions, employees, taxes, and customers to businesses throughout the world. Adams Guest Checks are the perfect way to create and maintain a professional image for small businesses and service providers. 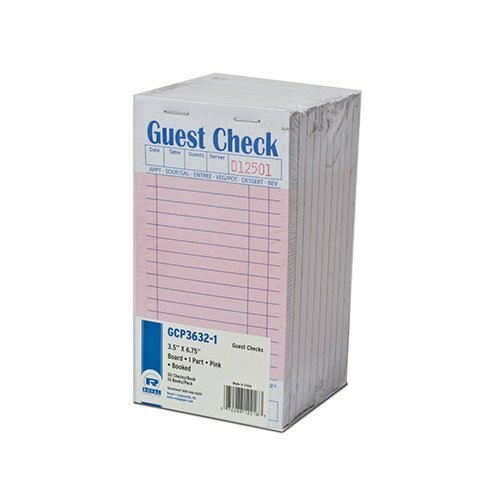 This single part guest check is made from a durable white tag stock and offers 50 sheets per pad, with 5 pads per package. The checks are consecutively numbered within each pad on both the top and on the bottom for easy record-keeping. The numbered bottom stub is perforated for quick removal and serves as a guest receipt. Each 3-2/5 x 6-1/4 inch check features a note of Thank You printed in blue ink on back. Whether it's a multi-part form, notebooks, writing pads, record books, or any of the hundreds of items we offer, you can count on Adams products to help! 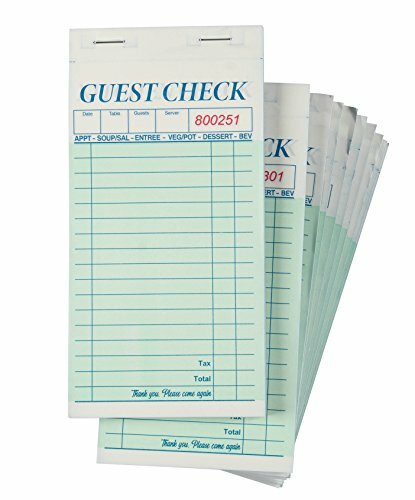 Single part guest checks printed on white tag, Dimensions - Book size: 3-2/5" x 6-3/4", Detached size: 3-2/5" x 6-1/4"
Waitresses, we are SICK OF IT! Your arms are burning from guiding 30-pound trays of pipin' hot food through cramped, dimly lit close quarters. ...AND you're trying to remember to grab a new fork for the gluten-free vegan at the 5 top in the corner. You deserve better. You need the tools that let you do your job the way you know how. And Mr. Plastic 2-Pocket just isn't going to get it done. That's why, right now, we're offering you OUR server book. This isn't a wimpy little deal that's going to make you look like an idiot, dropping change and credit cards all over the place all night long. THIS is a professional's server book. NINE pockets (including a zipper pocket for change). PU leather, so you look like a pro. Metal reinforced corners, so this thing is practically indestructible. But it's still lightweight and small enough to fit into your apron. TLDR; It's the perfect server book. Click the "Add to Cart" button NOW to receive the last server book you'll ever use. Ever heard, "When are you going to get a real job?" Yeah... me too. But can you blame them when your number one work tool is a tattered, plastic server book? You don't see businessmen walking around with a grocery bag full of documents! No. They are professionals and use professional tools. And you should too. Click "Add to Cart" now to serve at your full potential. 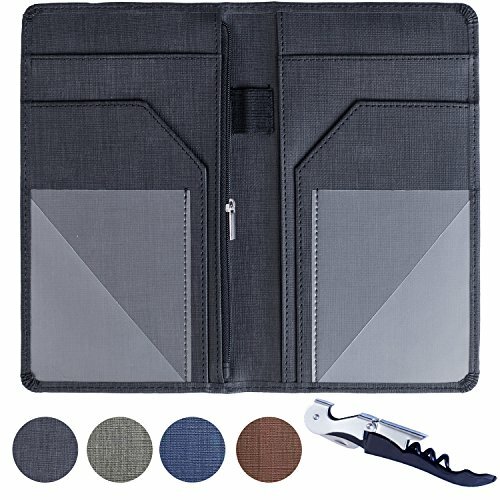 REDUCED STRESS OR YOUR MONEY BACK- The amazing array of pockets on this luxury waitstaff book will make your job easier. And if it doesn't? No problem, you get your money back! NEVER LOSE/DROP CHANGE AGAIN- No more chasing runaway quarters across the restaurant after you dropped them, because now you have the perfect place to hold your change! LOOK PROFESSIONAL- Every professional deserves the right tools. Your flimsy, black, 2 pocket book just isn't cutting it. Upgrade your book so you can serve at your full potential! NEVER LOSE YOUR PEN AGAIN- Ever had a pen last more than a week? Yeah, me either. Never lose a pen again with the leather pen holder strap in these incredible server books! WE UNDERSTAND- Everyone at Server Plus has waited tables. That's what motivated us to craft this server organizer to perfectly meet your needs. Click Add to Cart now to make your job easy! Using Royal Pink Guest Checks is an easy way to improve order accuracy and leave your customers feeling satisfied. By using an order pad, serving staff do not have to commit customers' orders to memory. This is particularly helpful when customers are part of a large group or have special requests or substitutions. When customers receive what they ordered, they are much more likely to be happy with their meal and service. This will lead to repeat business and more revenue for your restaurant. These server pads come without carbon copies. The sheets are attached to a cardboard backing with staples. To remove a sheet from the server pad, tear along the perforated line at the top. Each page contains helpful headings and menu prompts for serving staff. Servers are easily able to write down what each customer requests for appetizers, soup/salad, entree, vegetables/potatos, desserts, and drinks. Each page has 15 lines, making them ideal for large groups or detailed orders. These pads are small and lightweight enough to slip into an apron pocket, providing easy and convenient access. CONVENIENT SIZE: Each pad has 50 checks. Small and lightweight enough for servers to comfortably carry. Paper is economical and lightweight. Book size is 3.5" x 6.69". LINED PAGES: Each page has conveniently spaced lines, perfect for easily keeping track of each person's order! Restaurant staff are able to complete their jobs more professionally. There is space at the bottom for recording tax and the total order amount. BETTER THAN MEMORY! These checks offer menu prompts, which helps servers relay information to the kitchen with ease. Menu prompts help avoid mistakes and lead to improved customer satisfaction! Encourages repeat customers! STYLE: These guest checks are in a one part book style. The book is held together with staples. A perforated edge at the top of the paper makes it easy to tear away without damaging the paper or the information. The book is composed of pink check pages with no carbon copies. HELPFUL FOR KITCHEN STAFF! 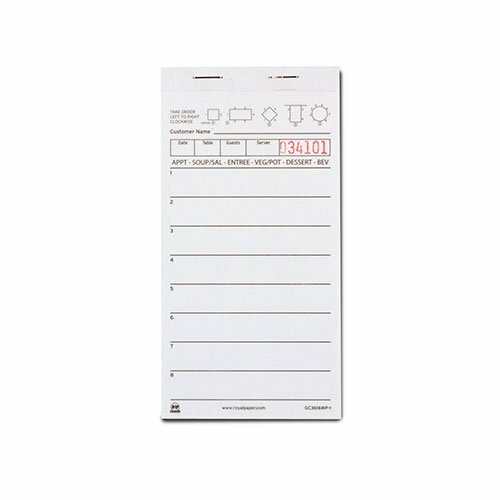 These server pads help kitchen staff keep track of orders, the number of guests in each party, and who is responsible for each table. Do you want the best server books for your restaurant? Our server books are built to last and have a smooth clean cover with no UGLY markings or LOGOS. Designed by members of the server community.! Our server book comes with 9 pockets, even one with a zipper for your tips, as well as a pen holder! Our books are made with quality products that blow all our competitors out of the water.We promise you will receive high quality server organizer books that will last! Trendy Look! Our books are trendy and will be a great addition to your restaurant. Clean Cover! We DO NOT stamp an ugly logo on the cover of YOUR server book. Designed by members of the restaurant industry. We know what you need and what works! Trust us to help you look like the classiest waiter or waitress out there!! Brinero Leather have the best server books on the market. 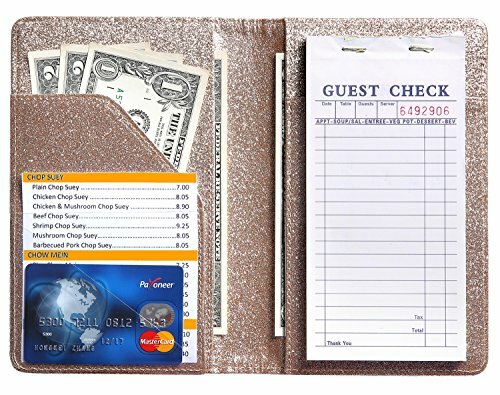 Our waiter books are trendy, easy to use, high quality and firmly hold standard size server pads. USA based company. If you are not 100% satisfied for any reason we will send you a replacement. DO YOU WANT THE STRONGEST AND HIGHEST QUALITY SERVER BOOK ON THE MARKET!?! Our server books are made of high grade materials, the best quality stitching and a solid binding that is STRONGER than our competition and built to LAST! We take pride in the quality of each and every book! 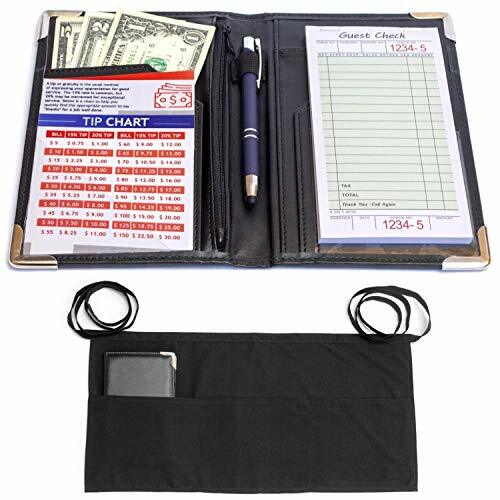 Each waiter organizer has a CLEAN COVER (we do not stamp an ugly LOGO on the cover of YOUR server book), A FIRM WRITING SERVICE, ROUNDED CORNERS and a ZIPPER MONEY POCKET. OUR SERVER BOOKS HAVE MORE POCKETS TO ORGANIZE YOUR DAY! Our server book has 9 POCKETS! 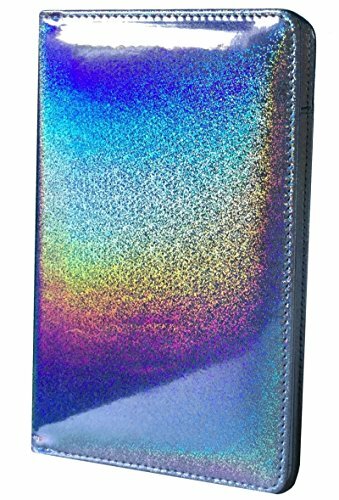 Including a zippered pocket that will keep your money secure and not weaken over time like magnetic pockets! Firm writing service when taking orders and a pen holder on the side not the middle for easier access! This is the best restaurant organizer, book holder, server notepad holder, waiter book on the market! DO YOU WANT TO IMPRESS YOUR MANAGER AND CUSTOMERS?! Coming to work with high quality items like this one makes you stand out. Your manager will see you are taking initiative getting your own server books, the clean black leather cover can be used in any establishment! These presenters will make a customer feel like they are in a high class restaurant. If you need a server book or book holder this is the product for you. Great note pad for waiters and waitresses! THE PERFECT SIZE FOR YOUR SERVING NEEDS! Our server book is the perfect size to fit in your apron. Doesn't jab you in the ribs as you bend over and won't hang on your aprons. 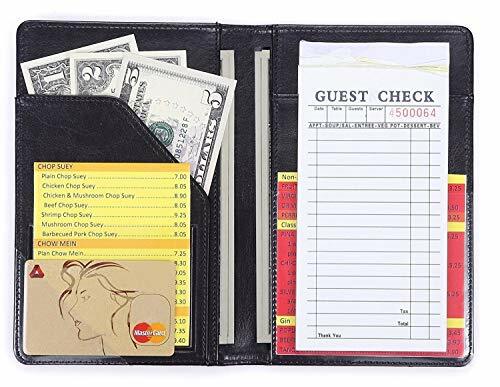 These are the most comfortable server books for waitress or waiter for your restaurants. This black leather book organizer has a clean cover with no logo! If you need a waitress book do not look any further! 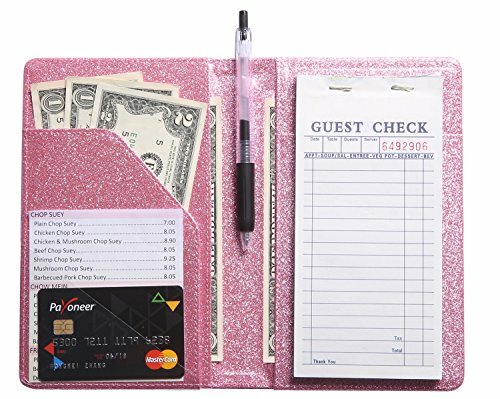 Your customers will be impressed with this check holder! GUARANTEED TO LAST! ALL of our DESIGN AND TESTING was done right here in the United States by actual wait staff. Our USA support stands by to provide you with the very best in customer service. Your satisfaction is our first priority. If you are not 100% satisfied contact us and we will make sure you are happy. Warranty: If you have an issue with your Server Book please contact us and we will do everything we can to make it right! When you need to take orders, whether you work at a restaurant, a dry cleaner's or have your own craft business, you need these guest checks. They will help you keep track of orders with sequential numbers, and the paper does not tear easily as it is 58g bond paper. It has space for the date, table number, guests, server, order and tax. There are 100 sheets per pad, so with this 10 pack you can take 1000 orders! Each pad is 3.5 x 7.5 inches. 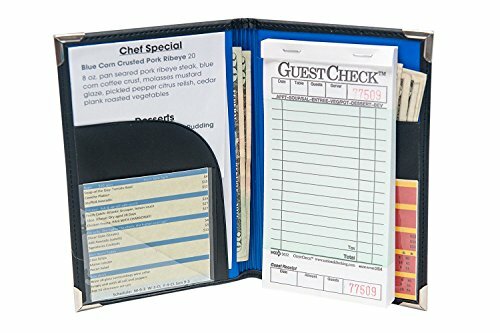 TAKE ORDERS: These classic guest check pads set can be used to keep track of customer orders in a variety of industries. Each pad comes with a 100 sheets and corresponding copy page. DURABLE PAPER: These order pads are made from 58g bond paper. KEEP ORGANIZED: Each pad has sequentially numbered orders to make it easy to keep track. LOTS OF BUSINESS: With 100 sheets per pad and 10 pads included, you'll take 1000 orders before you run out. DIMENSIONS: Each pad measures 3.4 x 7 inches. Improve accuracy, improve customer satisfaction! These server pads help serving staff relay customer orders with ease and accuracy. Menu prompts help prevent mistakes. Improved customer satisfaction will result in repeat customers! 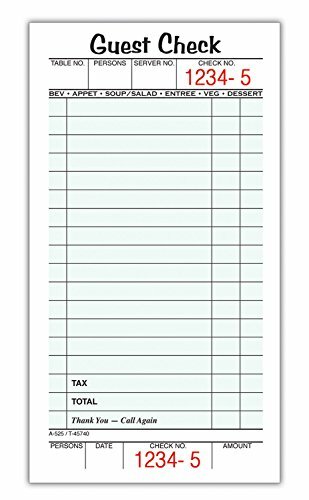 These order pads are small, lightweight and easy for servers to carry. They are one part books, with no carbon copies. Each page has 8 lines, with space for the date, number of guests, the table number, and menu prompts. CONVENIENT SIZE: Each pad has 100 checks. Small and lightweight enough for servers to comfortably carry. Paper is economical and lightweight. Book size is 3.5" x 6.75". LINED PAGES: Each page has eight lines, perfect for easily keeping track of each person's order! Restaurant staff are able to complete their jobs more professionally. BETTER THAN MEMORY! These checks offer menu prompts, which helps servers relay information to the kitchen with ease. Menu prompts help avoid mistakes and lead to improved customer satisfaction! STYLE: These guest checks are in a book style. The book is held together with staples. A perforated edge at the top of the paper makes it easy to tear away without damaging the paper or the information. The book is composed of single sheets with no carbon copies. 4.7 x 7.5 inch, with 7 pocket, made by faux leather, simple and endurable, keep you organized on the go. if you have any special request, please feel free to contact us, we may made new version for you. Small size 4.7 X 7.5 inch, fit regular guest check (which is not included), can be put into apron pocket. Made of faux leather (or to say synthetic leather), sturdy and looks decent. If you have any idea about how to make a better server book, please feel free to contact us, we would love to improve and adapt for your request. We noticed a small but painful problem that the waiting staff of the restaurant were having to deal with. Collecting cash tips was nearly always awkward and time consuming. This problem had a simple enough solution. We smartly engineered a new magnetic server book which is the most functional yet fashionable accessory for the wait staff industry. The customers who just want to pay and leave. Most importantly, the hard-working waiting staff. 12 POCKETS INCLUDING MAGNETIC POCKET Waiters, waitresses and waitstaff let Ogalv serve you! Ogalv are the creators of the world's first magnetic servers book . 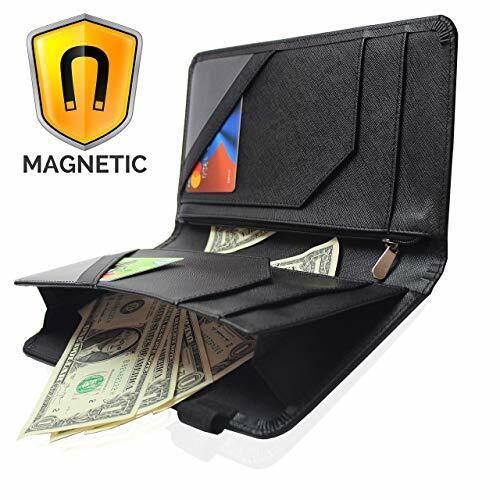 A deluxe 5x9 server book organizer that features an innovative powerful magnetic pocket that will expand 2 inches wide to hold your hard earned tip money firmly in place. 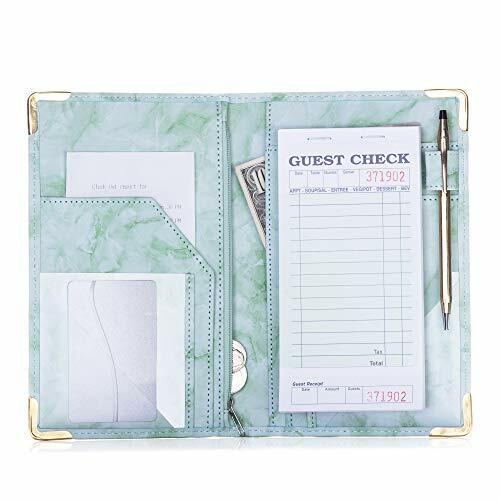 A FLEXIBLE WAITER WAITRESS BOOK WITH MONEY POCKET AND ZIPPER Perfect server books for waitress and waiters that feature a zipper money pocket and our signature magnetic pocket as standard. Easily access change, coins, cash and bills with ease whilst on the go in that busy restaurant environment. Perfectly designed with non-stick pockets. 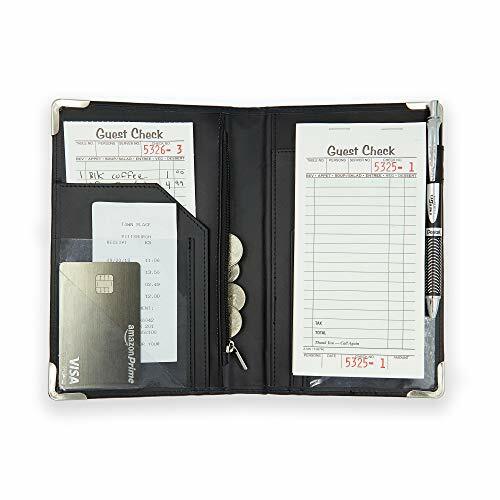 An awesome waiters wallet for anyone responsible for banking and cashiering. TALL AND THIN Rather than using a traditional guest check presenter, use our long waiter waitress books. We have smartly engineered it to be only 3 quarters of an inch thick. It will hold a standard guest check (not included) and fits perfectly inside your waiter waitress apron. EXTERIOR PEN HOLDER & ROUND EDGES NO METAL CORNERS Avoid those annoying ink stains and benefit from our exterior pen holder. Our beautifully designed books boast elegance and stray away from traditional metal corners that only dig into you when sitting and bending. CLASSY COLOR CHOICES - These marble style server books come with a choice of classy colors such as this unique jade green color. This soft marble style deluxe server books are great for servers wanting a unique style in addition to a classic look and feel. 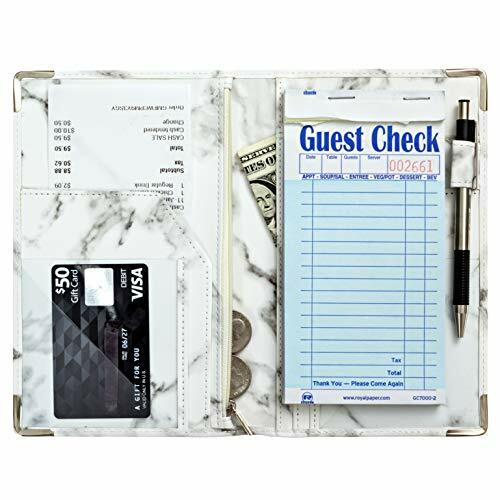 LIGHTWEIGHT and CONVENIENT SIZE - This marble server book is easy to carry around and at an approximate standard size of 5.2 inches wide x 8.2 inches long, this fits comfortably in many server aprons and fits many standard guest check pads (not included). The beautiful color metal corners protect the corners while being safe for your apron and your sides! MaryOnArt is a brand dedicated to fulfilling the needs of the HoReCa industry and it comes with solutions to make things easier for restaurant owners and for employees as well. Our waiter book is a must-have tool for any of you working or owning a business in this industry. THE WHO - Who needs it? Are you a waiter? Do you want to ease the process of taking orders or to better organize your bills, money, tips and price lists? Then, this server book with zipper is for you. Are you a restaurant owner? Do you want your employees to be more organized? Then, choose the MaryOnArt bundle and upgrade their look and their efficiency. THE WHEN when do you want to be more effective and to earn more? Don t forget about our win-win deal. Order it with no fear because you can replace or ask for a refund if it s something wrong with the product. Sparkly and glitter, shine like rainbow. 4.7 x 7.5 inch, with 7 pocket, keep you organized on the go. Made by sparkly glitter material, and the color changes with view angle. It's probably the most beautiful server book. With clear coating, it's smooth and doesn't come off on stuff while being used. Can be cleaned with wet cloth. If you have any special request, welcome to share with us, we may make new version for you. If, in any case, you are not happy with the purchase, please send email too. we will send you refund within 3 month, or replacement within one year. Made by sparkly glitter material, shiny and pretty. 4.7 x 7.5 inch, with 7 pocket, keep you organized on the go. if you have any special request, please feel free to contact us, we made new version for you. 7 pockets and compartments for business cards, credit cards, receipts, etc., help you to get organized. It also can be used as a personal organizer for travel and daily work. If you have any suggestions of how we can improve our server book, or additional items you would like us to make available, please send email. We value your opinions as we strive to improve and update our products and service so as to please our customers and supply their needs. Sturdy and durable. If, in any case, you are not happy with the purchase, please send email too. we will send you refund within 3 month, or replacement within one year. Made from eco-friendly vegan leather and reinforced for additional durability. Sturdy construction and nice to touch. 5x9 inch organizer fits perfectly in any apron and sits very well in hands. Stay organized with our server book featuring 11 pockets for all your needs: full length check holders, note pad holder, zippered cash pocket, no stick clear pockets, and pen holder. Keep your hard-earned money safe and within reach. Most restaurants require waitstaff to have their own wine opener. Hit two birds with one stone with this amazing purchase. PREMIUM QUALITY: Made from eco-friendly vegan leather and reinforced for additional durability. Sturdy construction and nice to touch. PERFECT SIZE: 5x9 inch organizer fits perfectly in any apron and sits very well in hands. EVEN MORE POCKETS: Stay organized with our server book featuring 11 pockets for all your needs: full length check holders, note pad holder, zippered cash pocket, no stick clear pockets, and pen holder. 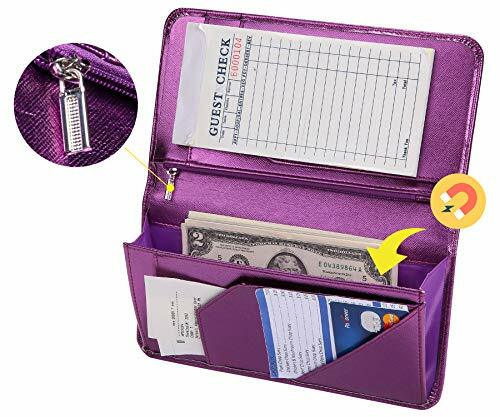 ZIPPER POCKET FOR CASH: Keep your hard-earned money safe and within reach. WINE OPENER and PEN HOLDER INCLUDED: Most restaurants require waitstaff to have their own wine opener. Hit two birds with one stone with this amazing purchase.  Sturdy, Useful and Attractive: magnetic closure pocket fits a big amount money. The pocket with a zip will keep your coin safe. Sparkly Material and fashionable design help you stand out from the crowd.  All in one keep your organized: It has everything you need to hold cash, coins, note pads, pen, credit cards and wine/food menu specials.  Size: 4.7 X 9 organizer fit for most apron.  Durable and Stretch: High quality soft PU leather for this premium server book, make it light weight and high end.  Guarantee: if you are not completely satisfied with the item, send us a mail, we will give full refund within 3 months or replacement within one year.